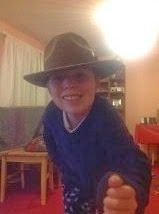 My son is eight on Tuesday! How quick the time goes. It's scary to think he's my last little one. I don't think it matters how many children you have, every milestone matters. This was no exception, but I have to say, I really struggle with little boys birthday parties! There's all that 'keeping up with the Jones's' stuff to contend with. I know we shouldn't care, but it's always hard to feel that you don't quite measure up in the Fab Parent Playground Xfactor. It's not really about the cost, I don't think. I've hosted every kind of party imaginable in my eighteen years in the parent game (see what I did there?!). I'm always staggered at how much even the most basic 'jelly and ice cream' type party actually costs. By the time you've bought all the paper plates, cups, decorative table cloths, etc, not to mention party bags! Then invested in tons of food. 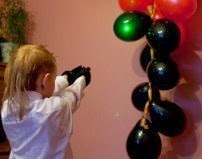 Do not get me started on kids parties and food! It drives me crazy. I go shopping, and I think, 'hmmm, sausage rolls... everyone likes sausage rolls, right?!' so I then by enough sausage rolls for thirty kids, you know, just in case! I then proceed to do this with every other party foodstuff I can think of, because who wants to see rows of over excited little ones fighting over the last cocktail sausage? It's the stuff of mummy nightmares!! Then, there's the parents to think of, the drinks, and let's not forget... potential vegetarians and food allergies! It brings me out in a cold sweat just thinking about it! Then, after all that expense, trying to cater for every possible eventuality, there's the cooking, packing it all up, carting it to a village hall somewhere in the back of beyond, up a steep hill, covered in ice. I digress, that's another story. Anyway, all of this is very expensive and time cosuming and, let's face it, children at parties would probably rather be, well, partying, not sitting quietly eating. I always used to find an awful lot of the goodies came back home with me afterwards. So, a couple of years ago, I made a decision. I would not provide food at parties. Instead, I would spend the money saved on a really exciting, fun experience that they would all really enjoy and remember and there would be drinks and cake. The first year I did this, the response was really surprising. The children were really happy not to have to stop their fun to sit down and eat, and the parents thought it was a brilliant idea to have the party mid-afternoon and leave out the expensive food bill. I probably worry far more than I should about getting these things right, but I do, I can't help it. It's not that I want him to have the biggest and the best, I just want him to have what's right for him and to have a really lovely time. 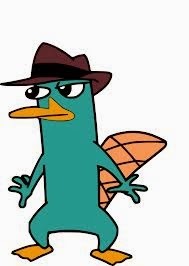 But how to incorporate his love of all things Secret Agent a la 'Perry the Platypus'? What you get on the day is a wealth of different spy gadgets and equipment to try out, including lasers to blow up balloons and bug detectors! there is also training in Spy Skills, such as Morse Code and brilliantly entertaining team games, with a spy theme, to keep all the party goers occupied. Party bags are included, with room to add your own preference of sweets or something healthier! The invites they send are lovely quality and really look the part. L's friends (and mums!) thought they were brilliant! 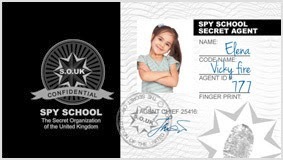 In addition to the party bags, all the children get to take away their very own Spy I.D. 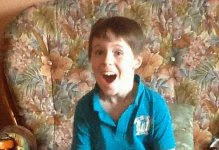 The website is very easy to navigate and L has been having a lovely time finding out everything he has to look forward to! We are very excited and looking forward to reporting back with our impressions of the event!! 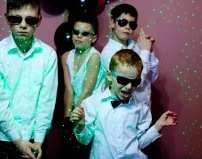 OMG my son would have loved a spy party when he was 8. Can't wait to read your report. I think the theme sounds brilliant!